One of the most requested side dish recipes in our house is Loaded Baked Potato Rounds. Everyone, including the pickiest eater, absolutely loves these potatoes. But what is there not to love? 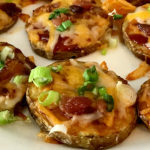 One of our favorite side dishes/appetizers – loaded baked potato rounds. Small slices of potatoes baked and then topped with barbecue sauce, cheese, bacon and green onions. Need I say more? I first was introduced to this tasty recipe when I was attending a Pampered Chef party. They were served as a quick and easy appetizer within minutes of the party starting. Because I was attending the party straight from work, I was very hungry when I arrived. Whatever was being served, I was going to try. And I wasn’t disappointed! The loaded baked potato rounds were baked perfectly on the baking stones. I didn’t have a baking stone, but a parchment lined rimmed baking sheet does just as well. And the combination of cheese, bacon and green onions was in their batter bowl just waiting to top each slice. But not before a layer of barbecue sauce was added to the top of each one! So let me recap: baked potato slices, barbecue sauce, cheese, green onion AND bacon! So How Were The Loaded Baked Potato Rounds Made? At the end of the party, as I was of course ordering items that I thought I would use every day, I asked the consultant how she made them. 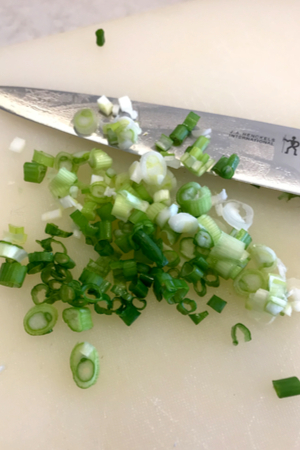 While the potatoes are baking, dice the green onions. I had missed the introduction to the recipe as I was attempting to park on the busy street. After my first bite of the loaded baked potato rounds, I was hooked. I knew that my family would love them as well. However, I didn’t want to interrupt the presentation to ask how the entire recipe was made. So when I was checking out, I questioned her about the recipe. That is when she told me that the actual recipe from Pampered Chef was called Western Potato Rounds. 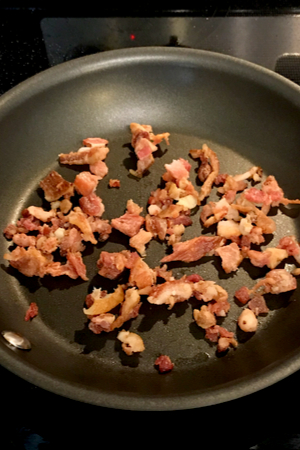 I cut and dice the bacon before frying it which helps it become nice and crispy quicker. The recipe was included in their most recent seasonal cookbook, so guess what? Yes, I bought the 30 page book that night. Loaded Baked Potato Rounds: Appetizer or Side Dish? Although we ate the loaded baked potato rounds as an appetizer, I knew that there was more versatility in the recipe. One weekend, when I was making pulled pork for dinner, I was searching for a side dish that would compliment the main dish. 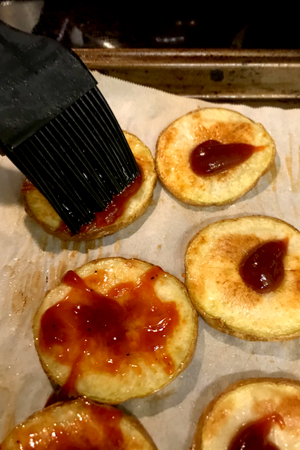 When the potatoes are tender, brush on the barbecue sauce with a pastry brush. Everyone was tired of mashed potatoes, and we had no fresh ingredients to make coleslaw. I opened the top cabinets above the stove which holds my recipe books and cards. I scrolled through them and came across the tiny seasonal recipe book that I purchased at that Pampered Chef party. A few glances through, and I knew exactly what I was going to make! The family fell in love with it! So much in fact, that they now request this recipe almost weekly. Sometimes they ask for it as a quick and easy side dish to dinner. And sometimes, it is requested for an appetizer for the big football game. Instead of mixing the cheese, bacon and green onions, I sometimes add them individually for dietary restrictions of some family members. I have now made this recipe over 100 times and I can honestly say, it has been made just as many times for a snack/appetizer as it has been for a fantastic side dish. 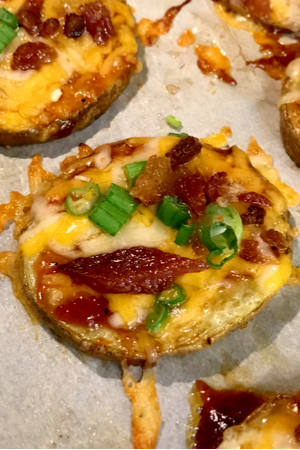 So if you have a few extra Russet potatoes around, impress yourself and family and friends with this delicious loaded baked potato rounds recipe! A delicious appetizer or side dish of baked potatoes slices topped with tangy barbecue sauce and loaded with cheese, bacon and green onions. 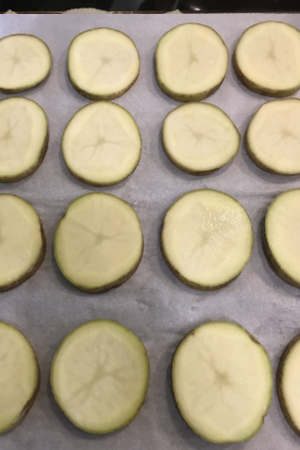 Cut potatoes into 1/4-inch thick slices. Generously spray both sides of the potato slices with olive oil. Place on a rimmed baking sheet, lined with parchment paper. Bake 20 minutes or until lightly browned and remove from oven. In medium bowl, combine cheese, bacon, and green onion. 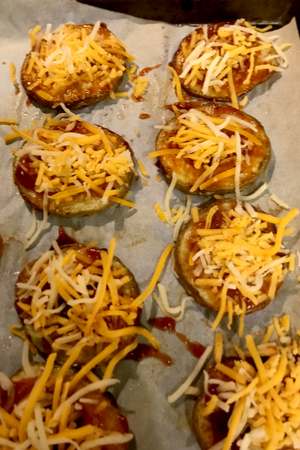 Brush potato slices with barbecue sauce and sprinkle each slice with the cheese mixture. Return potato slices to oven and bake for an additional 3-5 minutes or until cheese is melted.